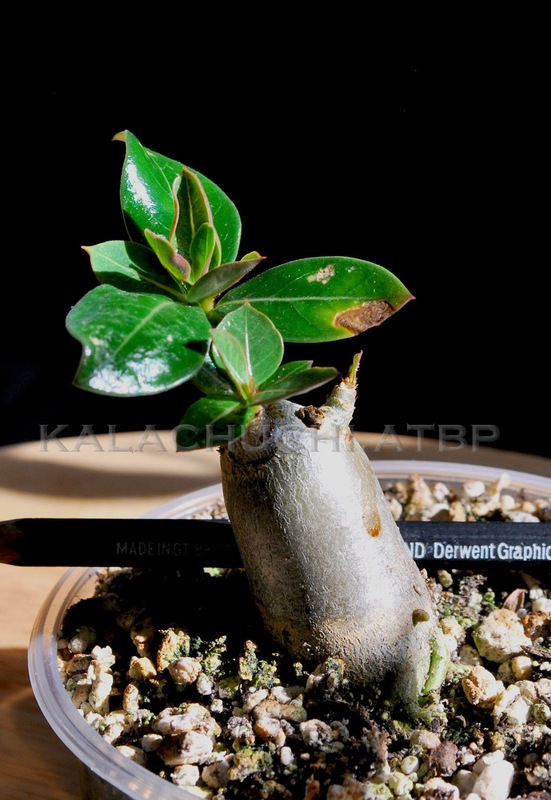 This is the 6th and final part of the series on growing adeniums from seeds. The seedlings we are looking at here are now one year old and almost ready to be treated as adult plants. First, a few words about growing hard. 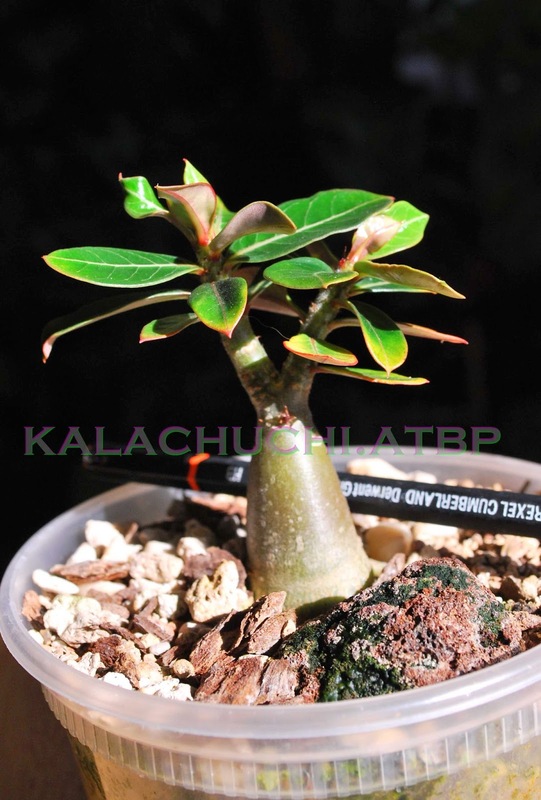 It is the easiest way to grow adeniums--all you need to do is leave it in the most killing sunny spot outdoors and forget to water it regularly. The plant's reaction to this neglect is to grow fat (to store water) and short (since it doesn't have to stretch towards the light the way it would if grown indoors). 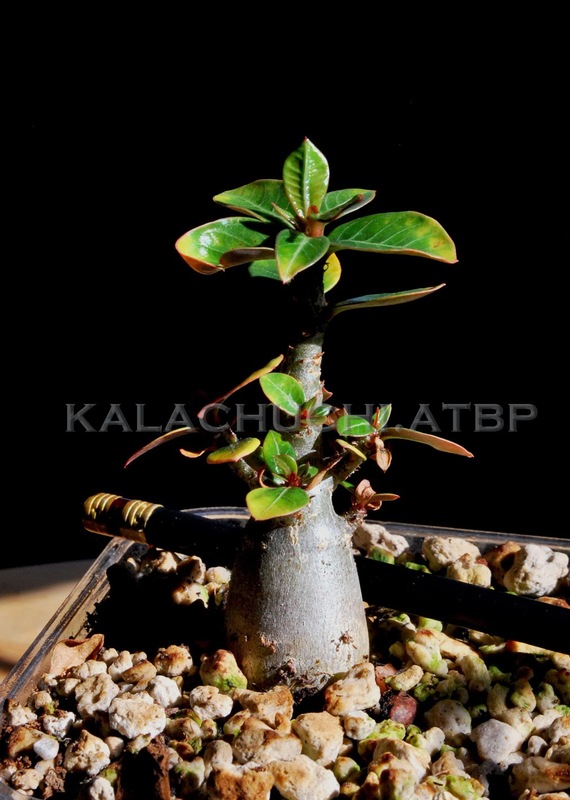 The best thing about Adenium obesum, however, is that they can take a tremendous amount of abuse short of a flamethrower. In previous posts, you'd have read that these seedlings were repotted quite often, mostly because experimenting with roots is fun. These seedlings will probably stay in these pots until they outgrow them, though. They are planted in gritty mix, with two to three lava rocks underneath so that the roots will have crevices in which to curl around. The plan is to check them out at the end of spring when it is warm and sunny enough to power the seedlings through the abuse of being uprooted. Someday, those roots will look great. We hope. This winter, some of the seedlings were put under a couple of 17-watt T5 HO fluorescent lights for 14 hours. The rest are on a rack against a south-facing windows, getting whatever sunlight is available and water whenever the idea survives more than five minutes. 1. Soil and Water. After a year of experimentation with various soil mixes, the 5:1:1 version of the gritty mix wins hands down in northern climes. 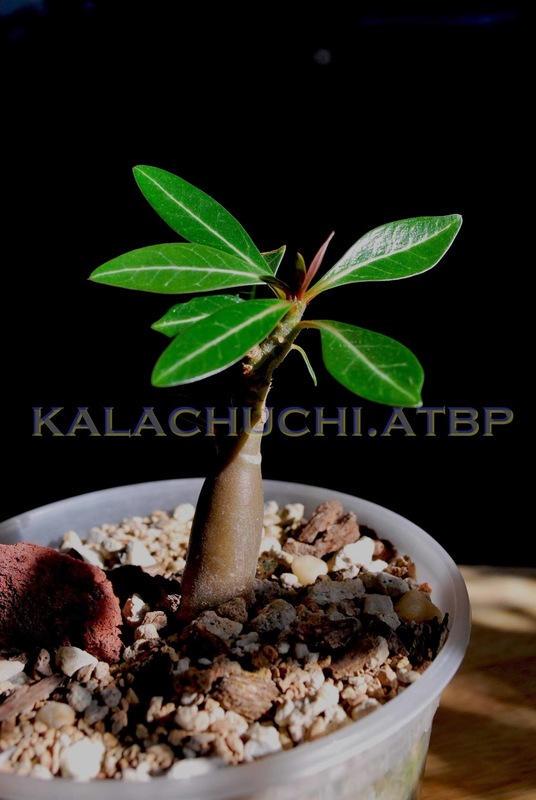 It is perfect for adenium but you have to watch it carefully when transplanting seedlings less than five months old because they will collapse from shock. It will take time for them to adjust and you will be sacrificing momentum. To avoid this, you have to water them them every day, probably even twice a day depending on how hot it is. Seedlings need more water than the gritty mix can hold for the amount of time it needs to hold it until you water them again. Young seedlings will survive the 5:1:1 gritty mix but they will need to be watered a lot. If you do not want to have to do this, the next best option is to just keep them in 50 percent soil and 50 percent pumice or perlite. In this material, watering every three days is usually enough. The advantage of moving seedlings into the 5:1:1 gritty mix is that this substrate will allow you to really push the plants---you can increase feeding without fear of burning because the substrate is easily flushed out. You can perform manipulations on the roots with reduced risk of root rot because you can water it freely. The material drains and dries out so fast that the plant does not end up sitting in wet soil too long. If you are not planning to experiment with your plant anyway, the 50-50 soil mix will do. Just be careful not to overfeed and over-water. If you do move your seedlings into gritty mix, it will take around five months of undisturbed growth for it to start getting some heft, provided they have light and heat. You can get away with watering less often. In fact, this is the point at which you can forget about them entirely and be alarmed when the leaves start turning brown from lack of water. They bounce back very quickly when you resume watering. Of course if you want them to grow quickly, some attention probably must be paid. But as a matter of personal preference, short and fat is the way these adeniums went for the first year. 2. Fertilization The seedlings, when they are fertilized, are fed with a solution of 1/8 teaspoon of 9-3-6 fertilizer diluted in about a liter of water throughout the year; with the frequency adjusted according to the seasons. They get fed more often (about once a week) in summer and this is tapered off in autumn. The ear plays a significant role in this entire process. When the temperature is unusually high, the seedlings get a wash of just plain water in between feeding. About once every three months (the apparent regularity is illusory, it's a ballpark), the fertilizer is supplemented further by a dose of 0-0-3 silicon supplement. Supposedly, this promotes nice strong leaves. Although this works magnificently for foliage plants like philodendron and night-blooming jasmine, it is a little bit harder to see in adeniums. Occasionally, just wash them with generous amounts of water to flush out whatever is building up in the soil. Since they are in gritty mix, the flush will actually work as a flush since this mix drains so freely that the only moisture that will stay in the pot is whatever the material can absorb. If you are using other soil types, you should pay even more attention to flushing out accumulated salts and things in the soil. 3. Sun. This can not be stressed enough. 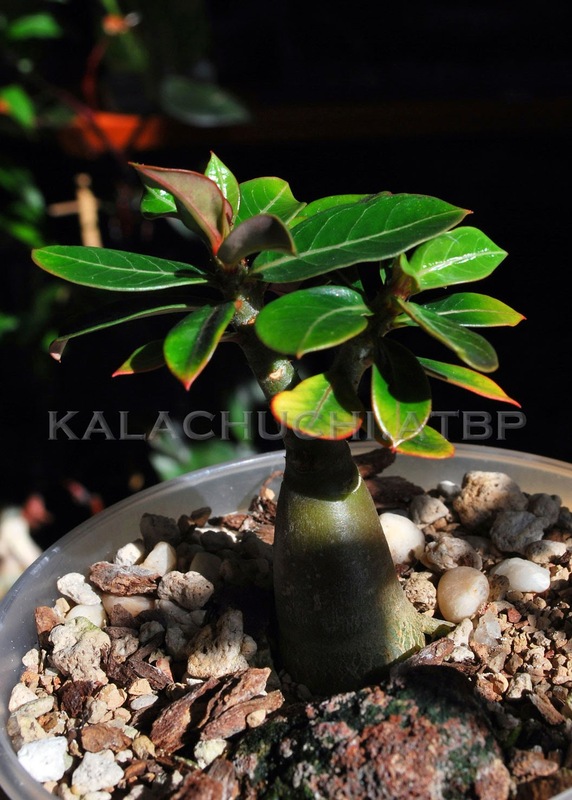 Adeniums need the maximum amount of sun you can provide them, regardless of age. These seedlings were germinated in January and were out in full sun for over 6 hours a day by spring. At the height of summer, they still got the fun blast of solar glory--as much as can be had outdoors. Here is they key: phase them in. Going outside from wintering indoors or just going outside from germinating in the shade, they need at least two weeks to adjust to harsh light. At first, put them in a spot where they get full morning sun. Let them stay there for a few days then move them to where they get morning and noon sun. After at least a week, move them out to where they can get as much sun throughout the day. During this adjustment period, the moisture in the pot will fluctuate because the exposure to sunlight will speed up evaporation so water them a bit more often, especially if they are in gritty mix. 4. Pruning It is never too early to prune your seedlings if they are not shaping up the way you want them. Just remember that if you whack off a branch, it will likely sprout two branches on that spot so try to imagine what it will look like with those two additional branches. These seedlings were pruned very early, at about two months when they were pinched. After about 6 months, one or two of them were sliced off because they looked too tall and lanky, growing too fast for my taste.Of course you can also just leave them alone. It is entirely possible to grow a seedling two feet tall in one year if you feed them enough. If you are growing them for the compact, stout look, however, bigger is not necessarily always better. Some people experience rot after pruning but even in the winter, I have never seen this and that is without what I would consider heroic measures such as anti-fungal gunk or, say, an hour in a decontamination chamber. Just wipe your cutter with alcohol before using it and keep the thing dry. 4. Rain What if it rains every day? Yes, what if it does? If it's in gritty mix, you have no problem. It'll drain anyway and adeniums can deal. If they are planted in soil that does not drain as fast, you'll have to babysit them. After this first year, the rest of it will probably be just more of the same. But they will be dug up for root check. Curiosity and all that.